A bazaar visitor checks out fabric scenes of Philly at one of the stalls. 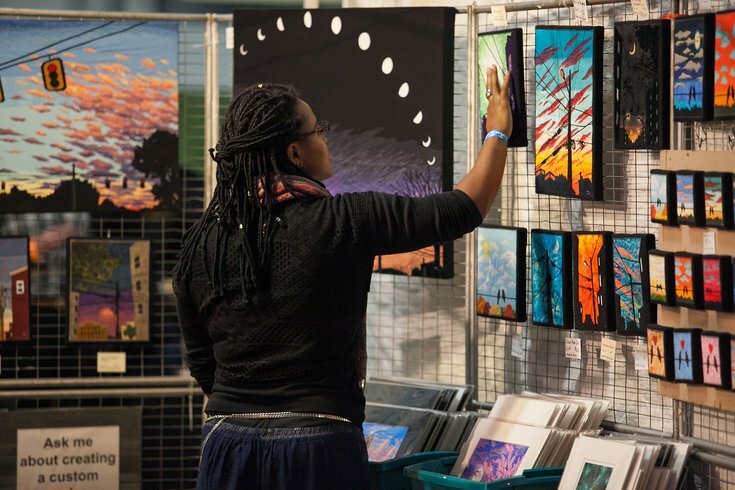 The annual Art Star Craft Bazaar will return to the Great Plaza at Penn's Landing for two days beginning on Saturday, May 7. More than 125 arts and crafts vendors will set up shop over Mother's Day weekend. Favorites from past years will return, and new vendors will make their 2016 debut. "Make + Takes," interactive arts and crafts booths, will also be set up by a selection of local artists and art organizations. 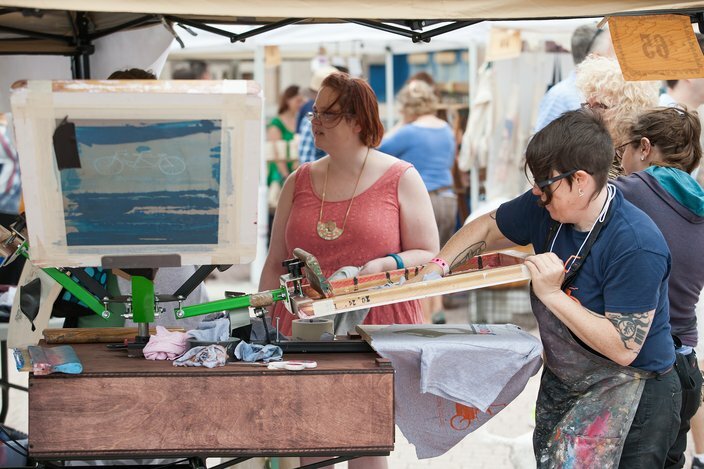 Create prints with Little Chair Printing's Bicycle Screen Printing Shop, carve a stamp with West Oak Design, make a pin from recycled fabric with Craft Space or create a terrarium with The Art Dept, among other crafts. The take-home projects are free -- except for Little Chair's prints. Buy a T-shirt to print on for $10 or bring your own and receive a discount. Little Chair Printing‘s Bicycle Screen Printing Shop creates prints with visitor help. Another part of the bazaar features demonstrations. Butcher’s Sew Shop will be on site to show sewing techniques. When you're ready to take a break from shopping and crafting, grab something to eat from on-site vendors Soy Cafe, Oink & Moo BBQ, Sum Pig, Kung Fu Hoagies or Poi Dog Snack Shop. As for entertainment, live music will start at noon on both days, with a new band playing every hour. The exact lineup has yet to be announced. The bazaar will run from 11 a.m. to 6 p.m., and the last band for the day will take the stage at 5. While the bazaar runs all day, getting there early might be a smart plan. Besides beating the inevitable crowds and being first in line to score fast-selling handmade goods, the first 150 visitors each day will receive free totes that include $5 Art Star Bucks and small goodies. Those who head to the bazaar can also stop by Spruce Street Harbor Park along the Delaware River Waterfront. It opens for the season that weekend.